These Carrot Cake Cupcakes with Cream Cheese Frosting are a healthier version of a favorite dessert! Heads up! This post was originally published in 2011. Photographs were updated 2018. There are a million (maybe more!) carrot cake and carrot cake cupcake recipes on the Internet. You will have no trouble finding one if you look. Most of the recipes for carrot cake cupcakes have the two main ingredients I prefer to avoid when baking as much as I can: white flour and refined sugar. So I set out to make a healthier version of an old favorite. I used white whole wheat flour instead of regular old white and sweetened it with just a tinge of maple syrup. These carrot cake cupcakes are definitely not overly sweet, but it works. Traditional cupcakes can be a bit much, so for me the sweetness level is perfect. While I don’t usually shy away from fats, I decided not to use oil in these. My purpose was to keep the calorie count in check as I knew I was going to top my cupcake with cream cheese frosting. So unsweetened apple sauce stands in where the oil would be. Even without the oil, these Carrot Cake Cupcakes are super moist. The texture is outstanding! What about the cream cheese frosting? You can’t have a carrot cake cupcake without cream cheese frosting. You just can’t. Don’t worry, I made the frosting healthier too! The maple-cinnamon cream cheese frosting I created for these cupcakes is amazing. Again I used maple syrup as my sweetener of choice and the result was fantastic. Trust me, I love traditional cream cheese frosting with the 2+ cups of powdered sugar. I think that’s why I fell in love with carrot cake in the first place. But this maple syrup sweetened cream cheese frosting does the trick with a lot less sugar. Fair question. I looked at Food Network Magazines recipe for Carrot Cake Cupcakes with Cream Cheese Frosting and plugged in their ingredients to see the calorie count. It came to just about 500 calories for one frosted cupcake. 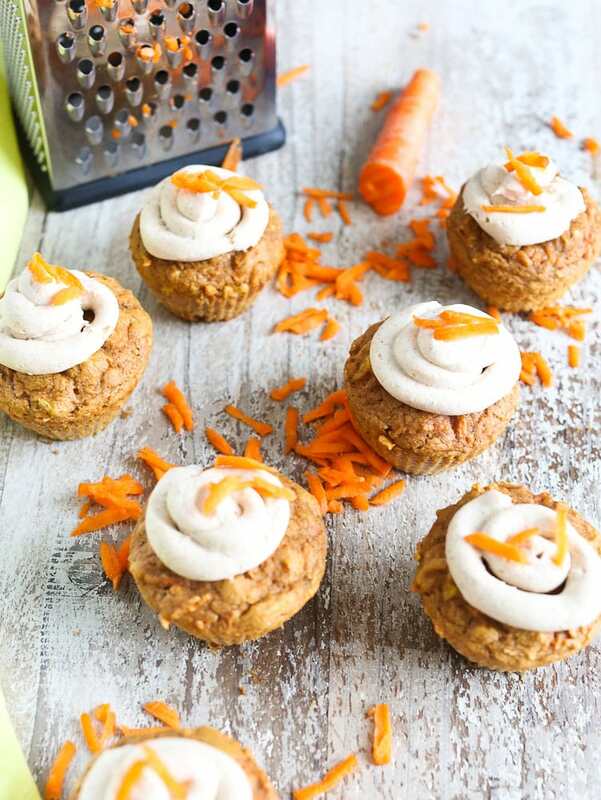 These healthier Carrot Cake Cupcakes are just 193 calories. BOOM. This Carrot Cake Cupcake is one that I can feel good about the kids eating and would be perfect for a 1st birthday cake. I might even call this a legit breakfast. Go ahead; when your cupcake is healthy, you can eat it for breakfast! 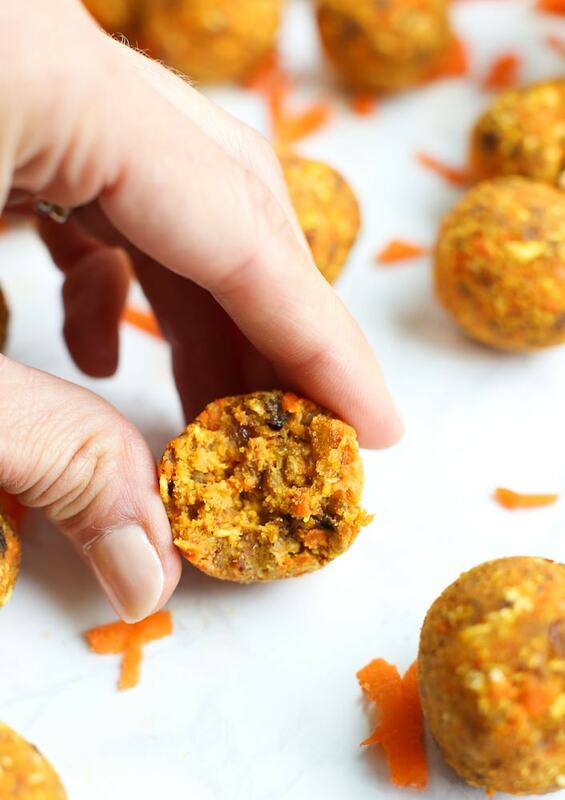 Use this printable recipe to help you make the best healthy Carrot Cake Cupcakes! 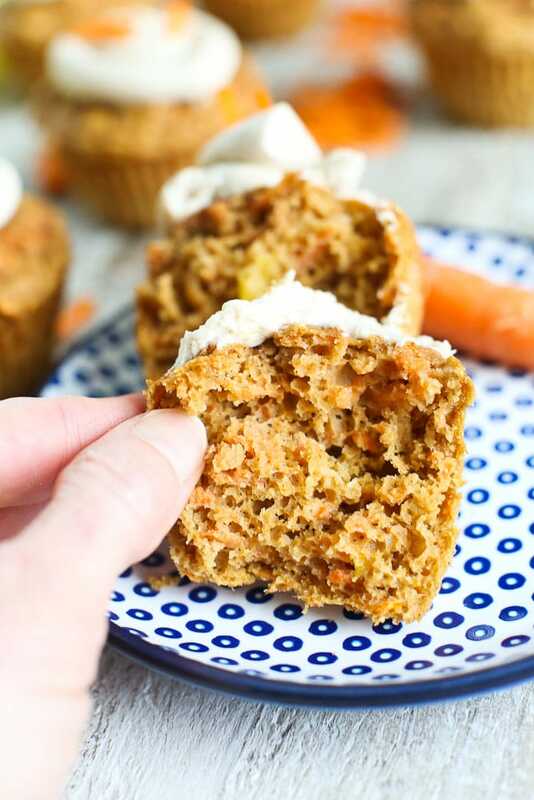 So much healthier than traditional carrot cake, this light version of Carrot Cake Cupcakes are flavorful, moist, and always a hit! In a medium bowl, whisk together the flour, baking powder, baking soda, cinnamon, ginger, nutmeg, and salt. Set aside. In a separate bowl, whisk together the eggs, applesauce, maple syrup, and vanilla. Stir in the pineapple and carrots. Combine the wet and the dry ingredients and stir until mixture is smooth. Spoon approximately 1/3 cup of the batter into each muffin liner. Bake for 22-25 minutes, until a toothpick comes out clean. Allow to cool on a rack before frosting. While cupcakes are cooling, prepare the frosting: In a medium bowl, beat together the cream cheese, maple syrup, vanilla and cinnamon until smooth and whipped. Frost your cupcakes once they are completely cooled. To frost your cupcakes, you can make them pretty by creating a make-shift pastry bag. Just snip the end of a plastic sandwich bag, put the frosting inside, and squeeze it out onto the cupcake. Easy! Enjoy! 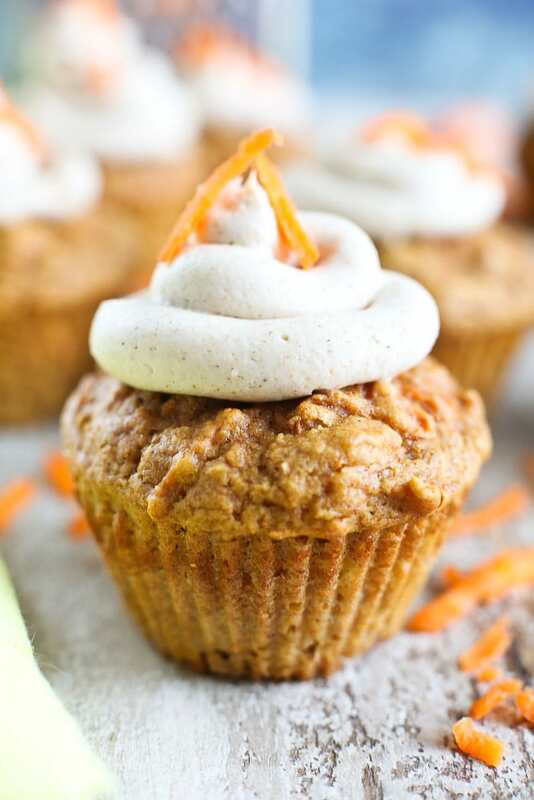 If you make this healthy Carrot Cake Cupcake recipe, or any Happy Healthy Mama recipe, I would LOVE to see it! Please take a pic and share it on Instagram or the Happy Healthy Mama Facebook page and tag me @happyhealthymama ? Also, if you try this recipe, would you mind rating the recipe with stars when you leave a comment? 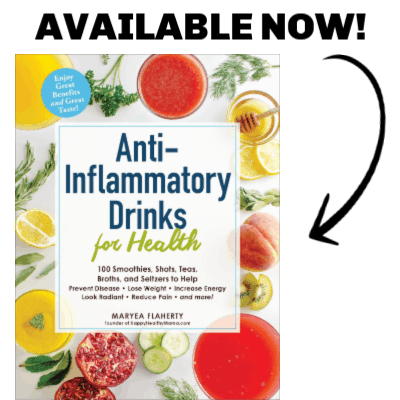 It’s VERY helpful for me and other readers if the recipes have ratings and reviews. I appreciate you! 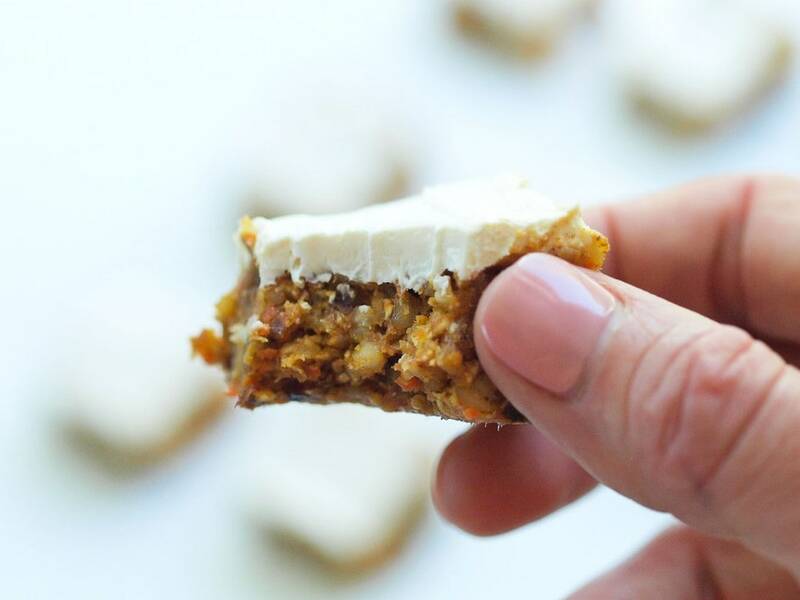 If you’re a big fan of carrot cake flavors, you’ll love some of my other carrot cake recipes! Check them out below and let me know if you try one! These look great. I love cream cheese frosting. Cream cheese frosting is my favorite! I was so happy that it was still delicious without all the powdered sugar. Thanks for this recipe. The boys and I might have to make these today as we are stuck home with 5 inches of snow last night and no school today. They look delicious and carrot cake is my absolute favorite. My little one loves to help out in the kitchen. It’s tough though because she wants to eat everything before it’s ready! She’ll even eat flour. Kids are so weird! I guess we can still be friends. 🙂 Meghan ate all the frosting off of the top and then said, “More cupcake.” I told her she only ate the frosting so far, not the cupcake. She said, “Oh, more frosting!” She is definitely my daughter on this one. I love cream cheese frosting! Just in time for our big 5th birthday! Maybe I’ll make these to send into school. Thanks! Aw–tell the twins we said Happy Birthday! Mmm, carrot cake–my favorite! Where was this post *before* my birthday this weekend? 🙂 Those sure look a lot better than the terrible vegan cupcake I got from Whole Foods! My little girl LOVES carrot cake. We actually had it for Christmas morning breakfast (per her request). I’ll have to give these muffins a go. I bet she’d love them. My little one would definitely eat these for breakfast, lunch, and dinner if I let her! These are perfect for Owen’s 1st birthday party in 2 weeks! Another great recipe that I’m sure we all will enjoy. I can’t wait to make these for Easter. Thanks for sharing such a wonderful recipe. I finally made these and I am in love with them! So delicious and I don’t even feel guilty eating them. Everyone I shared them with also loved them! Glad to hear it! 🙂 Thanks for letting me know. I made these today for my mommy group and they were a huge hit! Thanks! The frosting is to die for! I’m probably missing it right on my face, but can you tell me how many cupcakes your recipe makes?? I don’t but I need to! Will put it on the list. Hey Maryea: What is your suggestion for when to make these for a 10 am birthday party? Should I make muffins night before & then just add icing in the morning or can I mix batter & refrigerate & then make in the morning or what? I think making them the night before and then icing them in the morning is a good idea. The frosting is simple, so that won’t take too much time. I’ve never tried making the batter ahead of time, so I am not sure how it would work. I am going to make these for my daughters 1st birthday party! I am going to do cupcakes and cake. What size pan should I use for making cake? Happy 1st birthday to your daughter! 🙂 This recipe will probably fill one 8 or 9 inch round pan. If you want a double layer (2 cakes), you’d probably have to make a double batch. I haven’t tried it as a cake, though. Let me know how it works out! Sounds yummy! Thanks so much for sharing. 1. When you say maple syrup do you mean the real kind, or maple flavored breakfast syrup…like Aunt Jemima? 2. Have you ever doubled the recipe or do you suggest making in 2 batches to get 24? I use real maple syrup. I have never doubled the recipe, but I think it would work fine. Let me know if you try it! I really want to make this today but do you think it will work ok as a cake rather than cupcakes? Sorry for the late reply. I do think it will work as a cake, but you’ll have to double it if you want a double layer cake. Let me know if you try it! Every time I make cream cheese frosting it becomes runny….any suggestions? I made these last night and I was absolutely shocked with how sweet they were (in a good way)! 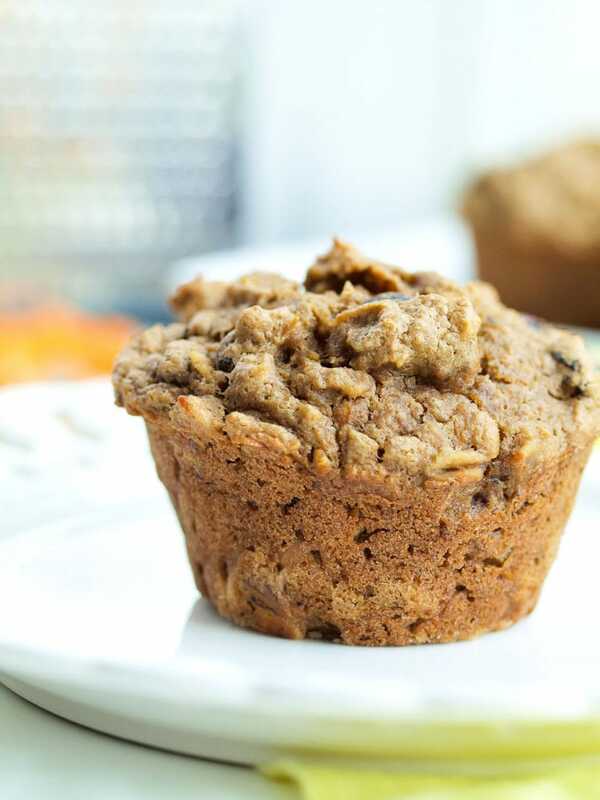 I just made the muffins and no frosting and they are lovely- frosted one with almond butter for breakfast 🙂 I added walnuts, raisins, chopped apple and coconut to them as well as a little molasses and sprinkled the tops with oats since I wasn’t going to frost them- super yummy! anyone have success making as a cake? Would love any tips. Sound SO delicious!! This is just what I have been looking for! I will be making these for my 2yo to take to school for her birthday. And you are right..there are TONS of recipes for carrot cake but most of them are very far from being healthy. Thank you! Hi, I may have missed it, but I can’t find what the yield is for this recipe. 12 or 24? Thanks! Haven’t tried the cupcake part of the recipe but made the frosting. Simply Divine!!! I will use this as my main frosting recipe from now on. I even used it as a dip for apples….cant stop eating it. Last Week was St. Patricks day, so my family decided they wanted carrot cupcakes with cream cheese frosting. I was going to use a classic carrot cake recipe that my family thinks is the best recipe ever, but…. Its made with one and a half cups oil, white flour, and TONS of sugar! The frosting has full fat cream cheese, tons of powdered sugar, and a bunch of butter.. I was annoyed because I was going to have to make these really unhealthy cupcakes that I would have to eat too. So I decided to do a sneak attack and find a healthier recipe for the cupcakes without telling anyone! I found this one and made them, and oh my gosh they thought I used the same recipe that I always use!!! I was so happy!! These were so moist and sweet, and I almost forgot they were healthy when I was eating my cupcake. Thanks so much for sharing this recipe! We are celebrating my little sister’s 16th birthday this weekend, and she has been trying really hard to lose weight so when she requested carrot cupcakes, I thought these would be the perfect fit for her to still have her birthday cake and eat it too. I am thinking about using the same amount of flour, but changing it to 1/2 cup of whole wheat flour and 1 cup of white all purpose flour, since we have a few “beef-eating men” in the family that won’t want it to taste TOO healthy. So I’ll try to be a little sneaky here and still have that “healthyish” factor. I also want to use 1/3 reduced fat cream cheese for the frosting, since that is what I have on hand. Hopefully the texture of the frosting doesn’t change too much. I used on online calorie calculator, and these still came out to 179 calories each – frosting and all. That’s amazing! I’ll let you know how these turn out. Thanks for sharing! These turned out great! They were not super sweet, as you said they wouldn’t be. So I made sure not to leave any sweetness out of the frosting – which was delicious. I made the cupcakes and the frosting the morning of, stored the cupcakes in airtight containers after they cooled down, and stuck the frosting separately in the fridge all afternoon to make sure it would stay firmer. Everyone loved them! Even those “beef-eating men.” 🙂 Thanks for the recipe! I just made the frosting and it is really good for my grandsons birthday party and the frosting is to runny to put in the cupcakes what am I to do any suggestions. You could either add more cream cheese or try adding a little starch (either corn starch or arrowroot powder). I hope it works out for you! Happy birthday to your grandson! You don’t happen to know the calorie information on one of these delicious little suckers? Not including the frosting…just a standard cupcake size? These are amazing and my husband and kids even love them!!! I just read some above comments and saw Katie posted the calorie count including the frosting….ummmmm 179 each? Not bad! I made these yesterday and they are already gone! They are amazing and we all love the frosting! I found this receipe on Pinterest and was so excited to try it for our guests who are watching their diet. I like the fact it has some great healthly swaps! However, the frosting tasted very tart and the cupcakes did not have much flavor. I followed the receipe perfectly too. My husband and I are probably going to be the only ones eating them because we don’t want to throw them out. I’m very sorry you didn’t enjoy these. They have always been well-received for us. I made these as written. I had to cook them a lot longer and they were still soggy. I would definitely skip the pineapple next time. These tasted like pineapple cupcakes, not carrot cake. I have them in a warm oven right now to try and dry them out a little bit. I’m hoping the frosting will redeem them. A good idea, but some changes need to be made to the recipe. Maybe adding nuts and skipping the pineapple would bring them closer to carrot cake. Interesting. I’ve never had that problem nor have I ever felt the pineapple dominated. You didn’t add the pineapple juice with the pineapples, did you? I’m sorry these didn’t meet your expectations. How many cupcakes and what size cupcakes does this recipe make? It makes 12 standard size cupcakes. Carrot cup cakes r tasty. I tried this recipe and loved it! Hi this recipe sounds great. Definitely going on give it a try. Is the pinapple needed? Is there anything that would be an OK replacement. My son gets a rash everytime he eats pineapple? ? I don’t have white whole wheat flour. I do have all purpose flour and whole wheat. Could I use one or the other of those, or a combo? Thanks! I would do 50% all-purpose and 50% whole wheat. I hope you love these! I’m planning to make these for my son’s first birthday party! How many cupcakes does this recipe make? Thanks! Im really hoping a get a quick response, from anyone please…. so i made these tonight and will be serving them for lunch tomorrow, should I put them in refrigerator? or keep them out? super thanks in advance! I think these would freeze great. My guess is they’ll keep for around 2-3 months in the freezer. I would defrost them at room temperature. I followed the recipe exactly as written but the batter turned out really dry. What is the consistency of this batter supposed to look or feel like? The frosting, on the other hand, was perfect! Can these cupcakes be frozen (without frosting)? Can the frosting be frozen in a ziplock bag? Yes, you can freeze the cupcakes. I have not tried freezing the frosting. Let me know if you try it! The frosting turned out a bit goopy for me, but 1/2 cup of powdered sugar is all it took to make it perfect. I know it defeats the purpose a little given that they’re meant to be healthy, but thought I’d mention it! Just made these this morning for the first time. Haven’t made the frosting yet. They haven’t even cooled yet. 🙂 The carrots seem really prominent. I think next time I will grate them on the smaller side of the box grater. I also think I will increase the amounts of the spices next time. Thanks for a healthier baked treat recipe! I had a quick question… is there a way to make this without the carrots and pineapple? Maybe substitute apples or bananas? Also.. is it possible to use homemade unsweetened apple butter vs applesauce? I think shredded apples and bananas would work in place of the carrots and pineapple, the flavor will just be different. And apple butter should work instead of apple sauce, also. Excited to try! Could I leave out the pineapple without ruining the chemistry? Also, going to use neufchatel cheese instead of cream cheese to make it even healthier! I *think* it would be just fine to leave it out. Please let me know how it goes! These turned out terrible. I followed the recipe exactly with no substitutions but they taste acidic and metallic, like there’s too much baking powder. They’re also very dry and bready, none of the sweetness from the fruit seems to have come through. I couldn’t get the cream cheese frosting to work either, I whisked it for at least 10 minutes but it never stopped being little lumps of cheese sitting in maple syrup. Honestly, even if I’d managed to get it to whisk the frosting didn’t taste that great either. Avoid this recipe, there’s so many other carrot cake recipes out there that would be an improvement on this one. Well, shoot. I’m sorry these didn’t turn out to your liking. I’ve had great luck with this recipe over the years and have gotten great feedback from other readers as well. I can’t imagine how cream cheese + maple syrup wouldn’t taste good together no matter what, but everyone has different taste buds, that’s for sure! I’ve also never had a problem getting my cream cheese to whisk together. Honestly, it sounds like your cream cheese was bad. :0 Thanks for your feedback and I’m sorry again that you didn’t enjoy my recipe. Our family’s favorite! So healthy! I added raisins in our carrot cupcakes. I can eat it without frosting! So delicious! Not too sweet!! I’ve made it like 5 times so far. I made another batch for Easter! I’m so happy to hear this Leah!